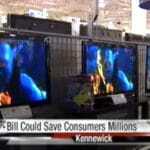 Executive Director Sara Patton is featured in this video segment from KNDO/KNDU News talking about a Coalition sponsored bill that would save Washington state residents millions of dollars on their electricity bills by requiring new TVs to be energy efficient. Kim Drury, Senior Policy Associate and Efficiency Works Coordinator appears in this King 5 report on the bill. You can find more information about the TV Efficiency Standards Act here.